United States military reportedly considering pulling troops from northeastern Sinai due to threat from ISIS. The United States military is considering pulling troops from a base in the northeastern part of Egypt's Sinai Peninsula, partly because of the increasing threat from Islamic State (ISIS) group jihadists, CNN reported Tuesday. The Obama administration may order the movement of some American and international troops into the southern Sinai, and is discussing such a move with Egypt and Israel, CNN said. The two Middle East countries signed a peace deal in 1979, agreeing that a Multinational Force and Observers (MFO) mission would monitor compliance. Some 700 American troops are part of that mission. 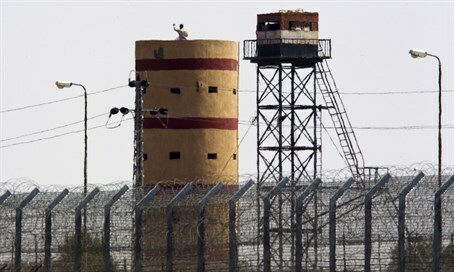 Most of the peacekeepers are stationed at El-Gorah camp, near the Gaza Strip. Pentagon spokesman Captain Jeff Davis declined to confirm or deny the CNN report. "We remain fully committed to the objective of the MFO mission and the maintenance of the peace treaty between Israel and Egypt," he told AFP. "We are in continuous contact with the MFO and adjust force protection capabilities as conditions warrant." Officials worry the threat of an ISIS group attack targeting U.S. forces in the region is increasing. Egypt has for many years been dealing with an insurgency in the Sinai which has gotten worse since the military ousted former Muslim Brotherhood President Mohammed Morsi. Among the attacks claimed by Sinai Province were the assassination of a top Egyptian police general, who was gunned down as he left his home in a west Cairo neighborhood, and a bus bombing on a tour bus filled with South Korean tourists.